T his course will introduce the major periods and events in the history of the English language. Students will become familiar with the origin of English and will be able to follow its development from the first written records to the present day. The course will offer an overview of important changes within each period of the history of English affecting different levels of language, including spelling, grammar, syntax and vocabulary. 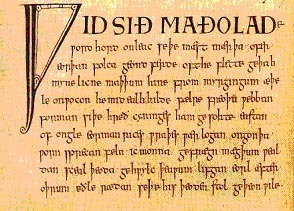 Linguistic changes will be studied in conjunction with historical and cultural events, such as Christianisation, Viking invasions, the Norman Conquest, the introduction of printing in England by William Caxton, colonialism, the Industrial Revolution and the globalization of the economy in the early modern and modern periods. The emphasis will be on the major, most influential, and interesting linguistic and cultural events and features within each period, such as the high status of English in Anglo-Saxon England, radical changes in the structure of language at the end of the Old English period, the multilingual situation in England after the Norman Conquest, the rise of literary language, the Great Vowel Shift, standardization efforts in early Modern English (including the publication of Johnson's dictionary), the development of English as an international language and as a language of electronic media. Students will be introduced to the methods of the historical study of English, including reconstruction and the use of original documents and texts. Dr Elizabeth Solopova has a a D. Phil in Medieval English from Oxford University. She is the editor of General Prologue to the Canterbury Tales on CD-ROM (Cambridge 2000) and contributor to British Library’s Electronic Beowulf. Her research interests include historical linguistics, textual criticism, palaeography, metrics and historical poetics. She is currently employed at the Department of Special Collections and Western Manuscripts at the Bodleian Library, Oxford University as a manager of the Electronic Catalogue of Medieval and Renaissance Manuscripts. She also teaches courses in medieval studies at the Departments for Continuing Education at Oxford and Cambridge Universities. Wright, J: Grammar of the Gothic Language (OUP 1917).